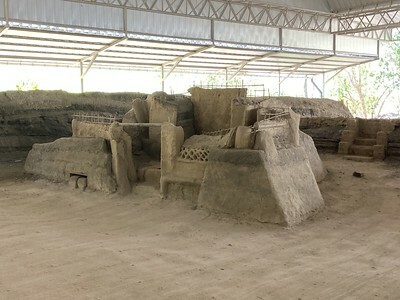 Joya de Ceren Archaeological Site is a pre-Columbian Maya farming village that has been preserved remarkably intact after it was destroyed by volcanic ash around 600 AD. Loma Caldera, a nearby volcano, erupted and buried the village under 14 layers of ash. The villagers were apparently able to flee in time - no bodies have been found - although they left behind utensils, ceramics, furniture, and even half-eaten food in their haste to escape. The site was discovered in 1976 by Payson Sheets, a professor of anthropology. Since then the excavation process has continued. About 70 buildings have been uncovered. Even more important than the buildings, however, are the paleoethnobotanical remains. The low temperature of the wet ash from Loma Caldera, as well as its rapid fall, ensured the preservation of much of the plant material. Of great importance is the discovery of manioc fields, the first time manioc cultivation had been found at a New World archaeological site. I visited this WHS in September 2016 during my Latin Grand Tour which last for 7 months. This is a very interesting WHS as most of the WHS in Latin America are related to Aztec, Mayan, Inca or Spaniards glory history, and Joya de Ceren is more to the daily life of the Pre-Columbian Mayan 1400 years ago. The ashes from the nearby Loma Caldera volcano eruption covered and preserved the site in time capsule, just like Leon Viejo and Pompeii. I recommend to visit the museum first before entering the archaeological site so that one will have a better understanding of what's in the archaeological zone. Most of the excavated items are here, for example you can see many ceramics with drawing of animal found in jungle like monkeys and birds. 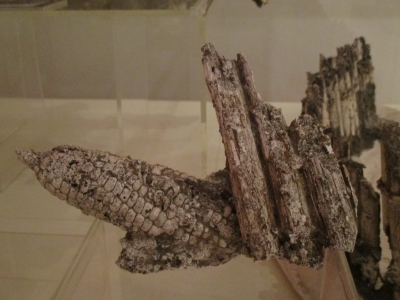 The most interesting item I found in the museum is the carbonized corn. This is the evidence of Mayan domestication of plants and up till today the Latinos are still eating corn as their main food. Joya de Ceren was a small Mayan village with 10 structures including some houses and storehouses. There is also a temazcal where the Mayan used as a sweat lodge to heal sickness. The site is not big and it will only take you around half an hour but interesting enough to be the only WHS in El Salvador. In 1990 I was on the Joya de Ceren archaeological team of Andrea Gerstle. There were six of us and many wonderful locals who housed us and fed us and worked with us at the site. We found the third house, in fact Jose and I found it, 15 feet down when we scooped up a fragment of what turned out to be the wall of a rammed earth house. Magnificent site. As noted it tells a tale of life among the 'common' people. "Certainly the American continent was far better off before the journeys of Columbus and the European takeover." Andy, How do you know this? There is nothing in the record to suggest that pre-columbian America, anywhere, was paradise. Especially in this neck of the woods. The Maya rulers where Kings and Gods at the same time. The Spanish Kings were no longer 'Gods' but might as well have been. When you get into the mix of it all most of the world has evolved about the same way. Because Andy, 'WE ARE ALL HUMAN AND HUMAN NATURE DOES NOT CHANGE VERY MUCH IN THE SCHEME'. Joya de Ceren is not your average pre-columbian/Maya site -- unlike the grandeur of Tikal and the artistry of Copan, Joya de Ceren is more about how the everyday people lived. Thus, it's definitely worth it if you're into such archaeology. We absolutely marveled at Joya de Ceren! It truly is a jewel and must not be missed when traveling in El Salvador. My husband is Salvadoran and American and he was so proud of his country and what they have uncovered. The museum was fantastic, the tour informative, and the landscaping meticulous. I had a wonderful time at the site about ten years ago and greatly enjoyed all that there was to learn and particularly the contrast with the Mayan ceremonial cities. However, I have to disagree with Ivette, though. We have not advanced at all. On the contrary, life remains very harsh for the poor majority. The environmental and social degradation a bus ride away in San Salvador with many people living in absolute misery is a vivid reminder of this. Certainly the American continent was far better off before the journeys of Columbus and the European takeover. Historical Food Remains: ICOMOS : "the objects recovered constitute a virtual inventory of their contents at the moment of eruption .... and a variety of foods ncluding maize, beans, chilis and cocoa beans"